It seems reminiscing is all I can do lately. It must be the age…I’ve lived half the life my father did and this thought makes me look back more. I miss my highschool friends, being in school and studying (or not), exchanging notes, jokes and laughter with them in between schoolwork and other activities. It’s like everything I look at are memorabilias of the life I’ve lived…but everytime I pick a scene to relive, it’s very clear as though it was yesterday. I’ve had my share of good food with friends back then. Simple meals and dishes concocted for a country-girl’s palate. In school, some common foodjoint, a special restaurant but mostly at home…friends’ homes. Once in a while, we get treated to something unique and unusual from the fare. Among the few desserts there were, Panna Cotta reigns supreme. Chefs could go wild with variations on Panna cotta, flavoring the cream while it heats. A little coffee, a fresh bay leaf, a touch of almond extract or torn mint works well…the possibilities are endless. 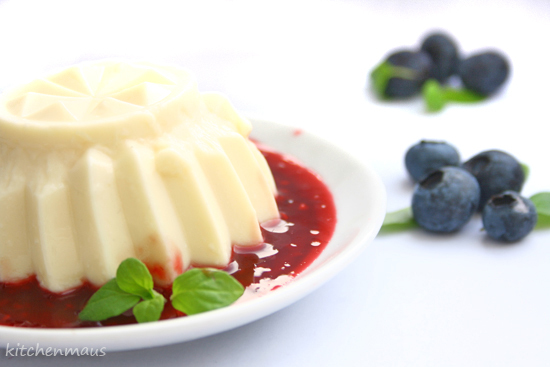 Panna Cotta ((italian) loosely translates to cooked cream. There could be differences in consistency among chefs, but I liked the one that Tita Minda would make for us, greedy it may sound but yes I can finish a whole serving of this… probably 250 grams… 😀 I am still not able to achieve that perfect consistency, as this is the closest I can get but hopefully in time and with practice I will. Here is an adapted recipe from an online cooking source. The sauce is a bottled strawberry concoction. I love it! G, you didn’t tell me you have a yummy entry…I was starving last night! LOL! 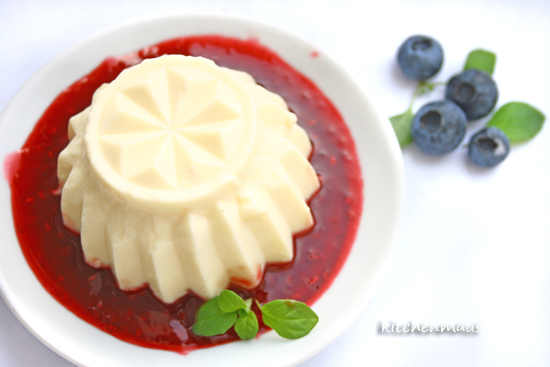 I see a stylish cloud of creamy gelatin sitting an a beautiful sea of ruby berry sauce. A work of art by itself, and stylishly delicious as a dessert! ang sarap naman ng RT entry mo! How yummy! Happy Ruby Tuesday! That’s beautiful! 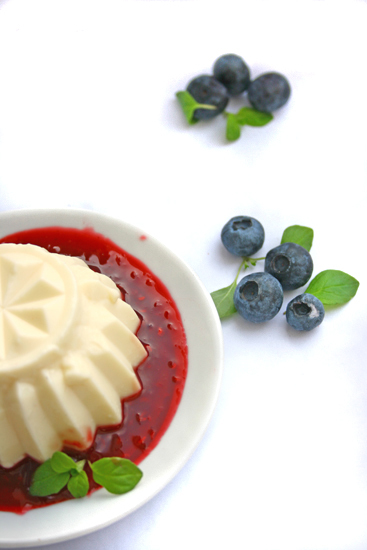 Blueberries are also my favorite to go with panna cotta. you are doing such a good job, sis! I really envy your prowess! that looks delish! 😉 thanks for the visit!